'Ustuu-Khuree' Festival Organizing Committee has determined the new dates for the festival. It will be held for the 8th time in Chadan in July, 5-9. The festival which has become a prominent event in the musical life of the Siberian region and of late has acquired an international fame due to the contribution of numerous foreign performers taking part in it, takes its name after the unique buddhist monastery constructed near Chadan in 1905-1908 with the help of Tibetan lamas. Over decades it had been one of the most significant spiritual and cultural centers of Tuva till it was ruined in the 30ties of the last century alongside with the 30 other Tuvan khurees. Moscow architect Villa Khaslavskaya discovered its ruins in the 70-ties during an expedition on inventarization of Tuvan cultural monuments.She made a research on the original architecture of the unique buddhist complex and made a restoration project of it in the end of the 80ties. Only 10 years later she managed to have this project included into the Federal Program of the Restoration of Cultural Monuments in Russia. 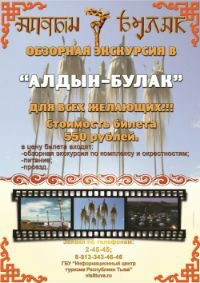 From that time on Moscow has began to send money to Tuva on the restoration works demanding it to be done bilaterally, with the Tuvan side as well. Nor has the Tuvan side begun to donate the restoration works neither has it spent the Moscow money on the project. Only the interference of the Tuvan parliament on Khaslavskaya's request has stopped its mischanneling into other needs and demands of the Tuvan ministry of Culture. Her aspirations connected with the creation of the charity 'Ustuu-Huree' festival which should have gathered money for the restoration project have disappeared after an 8-years-long history of the festival throghout which not a penny came into the budget of the restoration of the Khuree.